I would think that recycling materials would be foremost on their minds. Beams like what are represented in traditional crucifixion would be scarce, or costly, in an area with few trees. For that reason, a crucifixion with what we consider a traditional cross would be better suited for Golgotha. The main part, planted in the soil, would tower over the people all of the time, while the cross-piece could be raised and lowered with the condemned lashed and nailed to it. The X style would have made it difficult for a couple of things. First is the sign nailed over his head, "The King of Jews". On an X, that would be difficult. With the T type, it would be easier. Secondly, when Christ was given the vinegar on a sponge, the soldier had to reach up with his spear to deliver that. Then the soldier that had to reach up to pierce his side. Lastly, let us take into consideration the cruelty of the execution. It was made as a long, drawn out painful process. the X style cross would be structurally more stable than a T cross. The T type cross would have a tendency to sway, inflicting more pain on the nerves the nails were driven through. Lastly, we come to the point where Christ was paraded through the streets carrying his cross. The X style would have been impossible to carry because of the size. Such a cross would need to have beams at least 20 feet long so the crowd could watch the condemned suffer and die. Whether he carried the T type cross, or just the cross beam to be affixed, basically, biblically, the T style meets the engineering standpoint. The X style would work better in areas of Europe, including the British Isles, but for the middle east and it's lack of trees, the T style would be better. It would also save an extra spike for the feet. Sorry, got into a discussion with a pastor on the cruelty of the crucifixion years ago and did some independent study as well. One thing is certain, man will use the material available to do what they feel they must. Remember, chop sticks were made from animal bones because that was a more readily available material than wood. It's fun how crosses have evolved over the century. Got any info on those russian crosses where a smaller piece is set under the top part in a way so that it's not parallel ??? I know the ones you're talking about. I recall hearing the explanation years ago, but don't recall the actual reasoning behind it. It makes me think, perhaps it's possible to create some new futuristic crosses that serves the modern myths and have interresting functions. 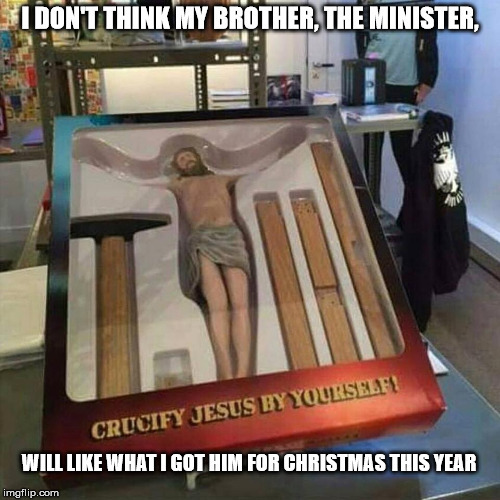 One new addition could be a prayerfriendly cross that allows you to get down easy on your knees to pray, that supports your preying hands and stuff like that ("The crosswhisperers friend" could be it's name) Crosses with incense holes. Stuff like that. Not sure if it's get a lot of support. Some Christians might think folks that would use them are lazy. I attended a couple of Pentacostal churches years ago. No just sitting down there. Went to Stations of the Cross with my girlfriend (who was Catholic) and all the up down up down, I expected a priest to come out in a sweat suit and whistle and have us do laps.